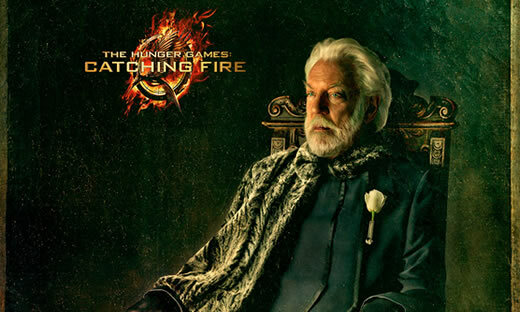 Donald Sutherland plays a mean meanie; his President Snow is ruthless. Lionsgate released the new trailer for The Hunger Games "Catching Fire" at this week's ComicCon in San Diego. The movie looks intense giving star Jennifer Lawrence a chance to flex those award-winning acting muscles; the trailer shows off some of other acclaimed actors in smaller parts including the talented Mr. Hoffman (Plutarch Heavensbee) and Donald Sutherland, who cuts a cold and ruthless presence as President Snow. Their creepy conversation about the necessary death of Katniss and just how that should play out so she's a symbol others learn from, rather than a symbol to inspire the masses, is chilling. "I think these games are going to be different"
The Hunger Games: Catching Fire comes out November 22, 2013. My husband and I liked the Hunger Games movie. Sounds as if we should like this one too. Good! I really loved The Hunger Games book, enjoyed the movie well enough. I just read Catching Fire this week because my son has been pestering me about seeing the movies. I made him read the books first, so we've both read the first two books now. I was really quite disappointed with the second book, but will go see the movie with him when it comes out. Am working on a full blog post about it.